Jo Jackson and Rebecca Adlington won silver and bronze in the 400m freestyle at the World Championships as Federica Pellegrini won in a world-record time. Jackson's time of 4:00.60 was a British record while Adlington clocked 4:00.79. Adlington admitted to being in tears after only qualifying for the final eighth fastest and said she was "ecstatic" with her bronze medal. "We've got PBs (personal bests). It's a very different environment, getting used to the heat. We are back to morning heats and evening finals," said the double Olympic gold medallist. "It's very different this time and obviously on home ground she has got all that crowd cheering for Federica, it's definitely her night. "It's definitely something I'm going to remember for the rest of my life. And in London (in 2012) that will be our crowd." Jackson too was proud of the way she had given the world's best a run for her money. "That last length I gave it everything. I tried to keep up with her. She just had so much more strength on that back 50," she said. "It was a personal best for me and it is one better than last year, which I have got to be happy with. "Obviously I would love to break that four-minute mark but it wasn't meant to be, but I've got to be happy with that." There was another world record set in the women's 4x100m freestyle relay, as the Dutch team won in a time of 3.31.72, almost two seconds faster than the previous world best. 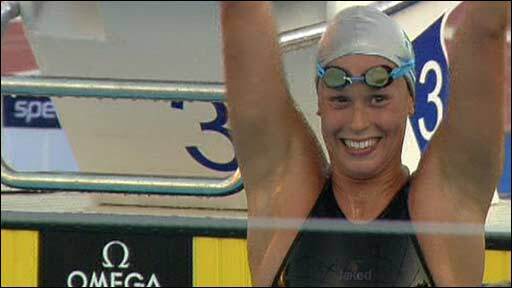 Germany were second, with Britta Steffen breaking her own individual world record of 52.22 secs while swimming the first leg. Australia finished third, with Great Britain's team of Fran Halsall, Caitlin McClatchey, Katherine Wyld and Amy Smith seventh in a new British record time of 3.36.99. The British men's 4x100m freestyle team - Adam Brown, Simon Burnett, Liam Tancock and Ross Davenport - also came seventh in their final, which was won by the USA, ahead of Russia and France. In the men's 400m freestyle individual event, David Davies came eighth, with Paul Biedermann breaking Ian Thorpe's seven-year-old world record as he won in a time of 3:40.07.